One of your favourite location lights is now a heat-free, low-power tungsten or daylight source. Instantly upgrade an existing Arri, Mole, or Desisti 2 kilowatt halogen Fresnel fixture to a high-performance daylight (or tungsten) colour temperature LED instrument in seconds. 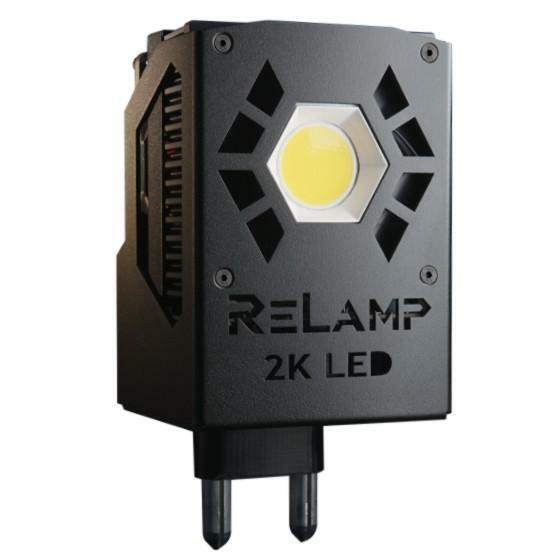 This LED Lamp is a direct replacement of the 2000W CYX Halogen Lamp. The 2K LED Lamp fits in most 2K Fresnel fixtures. It has the standard G38 Bi-Post socket so you can simply drop it into your 2K Fresnel just like the CYX Halogen lamp. It even fits in the compact 2Ks from Arri and Mole (Baby and Junior) found on many grip trucks. It dims like a tungsten bulb but without colour shift. Leave the fixture plugged into your existing dimmer, no change or addition to studio wiring. The upgraded light draws only 270 watts and supports external legacy dimmers, requiring no change to infrastructure. It focuses from 20 to 50 degrees using the fixture’s existing mechanism. It produces high-quality, daylight-balanced light with even spectral distribution. The daylight version is 95 CRI, the tungsten version is 98 CRI. The upgraded light draws only 270 watts and supports external legacy AC dimmers. It focuses using the fixture’s existing mechanism. It produces high-quality daylight-balanced light with smooth natural spectral distribution – Daylight 95 CRI and Tungsten 98 CRI. Be 1/4 the cost of any comparable LED. ROI: A typical TV studio saves thousands in the first year.